The Technium: Are We Duped By the Technium? If technology is so bad for our spirits, why do we consume it? For all the benefits technology has brought us, the costs of those benefits often glare too obvious, and for many of us, seem too dear. We definitely have More – more stuff, more knowledge, and more choices – but strangely according to newspaper polls we seem to be less equipped, less wise, less happy. What progress means for some people is that by the miracle of modern medicine, we can be unsatisfied for decades longer than ever before. Some year in the future, science will enable us to live forever, so we’ll be unhappy forever. There is a widespread feeling that the technium grows by consuming irreplaceable resources, ancient habitat, and myriad wild species, yet returns to the biosphere only pollution, pavement, and myriad obsolete junk. Worse, this same technology takes from the least in the world – the nations with the most resources and least economic power – to enrich the most powerful. So as progress fattens the lives of the lucky few, it starves the unfortunate poor. Thus the expanding technium robs us of our humanity, and it also steals our children’s future. Therefore the so-called benefits of technology must be an illusion, a sleight of hand trick we perform upon ourselves to permit our addiction to the new. That’s just the material aspect of the downside of technology. Technology is seen by many to prohibit a sense of the sacred or any kind of spiritualism. The technium’s rampant materialism outlaws greater meaning in life by focusing our lives on stuff. But in a blind fury to find some kind of meaning in life, we consume technology madly, energetically, ceaselessly, buying the only answer that seems for sale – more technology. “Needing more to be satisfied less” is one definition of addiction, and this is one explanation of why even those who intellectually despise technology still get the newest things. In other words, we are aware of how bad it is for us, but we continue to use it because we can’t help it. We have no choice. I am skeptical of this addiction thesis. I see the logic but not the evidence. I personally don’t feel it, and I am bothered by its presumed ubiquity. On the other hand, technology is castigated by those who depend on it. If everyone finds technology so horrible, why do they continue to embrace it? For embrace it we do. Some of us use technology more selectively than others, but we can safely say that without exception every human alive on earth now uses technology to some extent (bows, arrows, lamps, plows, and so on), More importantly, all humans in my experience are tempted by better stuff. The general pattern for our species, past and present, is a mad rush to inhale the latest technology available. This is just as true for those who view technology as a disease. I have a very vivid memory of interviewing the neo-luddite Kirkpatrick Sale, one of the fiercest living critics of technology, lounging in his brownstone apartment in downtown Manhattan, centered in perhaps the most technological place on earth. With no irony Sale railed against technology (and civilization) as the worst thing to happen to the planet and humans. He was of course surrounded by sophisticated technology that he had no intention of giving up. Ever. I don’t mean to single out Kirkpatrick Sale, because his hypocrisy is ours. If we so clearly see the overwhelming cost of increasing technology on the world, why aren’t we joining a huge migration of people returning to a pre-technological state? One explanation is that we are duped. Not so much addicted as simply hypnotized by glitter. Technology, by some black magic, has impaired our discernment. In this account the technology of media disguises the true colors of the technium behind the front of utopia. Its shiny new benefits instantly blind us to its powerful new vices. We operate under some kind of spell. But it must be a consensual hallucination, because we all want the same new stuff: the best medicines, the coolest vehicle, the smallest cell phone. It must be a most powerful spell because it affects all members of our species without regard to race, age, geography, or wealth. This means that everyone reading this text is under this hex. The hip college-campus theory is that we are duped by corporations peddling technology and presumably by the executives running corporations, but that would mean that the CEOs are aware of, or above, the hoax themselves. In my experience, they are in the same boat as the rest of us. Believe me, they are not capable of such a conspiracy. The unhip theory is that technology is duping us itself on its own accord. It uses technological media to brainwash us into thinking that it is wholly benevolent, and to disappear its downsides from our minds. As one who believes the technium has its own agenda, I find this unhip theory plausible. Its anthropomorphism doesn’t bother me at all. But by this logic we should expect the least technologically cultured people to be the least duped, and to be the most aware of the plainly visible dangers. They should be like the children who see the Emperor without clothes. Or with wolf’s clothing. But, in fact, those disenfranchised people not under media’s spell are often the most eager to trade in the old for the new. They look the juggernaut of the technium in the eye and say to it: give me it all, right now. And it is often the most technologically mediated people who “see” or believe in the presence of the technium’s spell. It does not add up for me. I am reduce to the one remaining theory: we willingly choose technology with great defects and obvious detriments because we unconsciously calculate its virtues as slightly greater, even if not by much. In other words, we are vaguely aware of the costs of technological novelty, but we freely chose to embrace it – and pay the price. I believe the costs of technology are not easily visible, and should be more articulated, more accurate, and better considered. 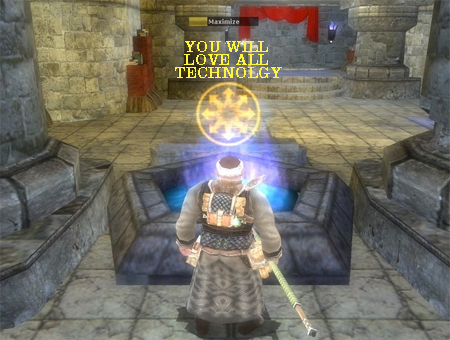 You could say I am under the technium’s spell because I believe that the way to surface the costs of technology is with innovative technology. Such things as real-time monitoring, deep analysis, relentless re-testing, and honest accounting of externalities. I take these tools as progress. Progress is out of fashion right now, but I believe at this point in our species’ history, progress demands a better account of technology’s costs. And when accounting for the costs of technology becomes common, progress will return to fashion. Occasionally a better account of the full costs will flip our embrace of the new, but I doubt it forces many of us to retreat from the technium because we are already doing this calculation every day (although not as precisely as we could). We see the societal costs of using an automobile, for instance, and we still use it (or someone else’s). Progress in illuminating the negatives of technology will enable us to tweak our embrace. It might also allow us to see that our embrace is done willingly, and is neither an addiction, nor a spell. It has been suggested that if our eye causes us to sin, we should pluck it out. If our hand causes us to sin, we should cut it off. In the same way if our technology causes us to sin we should cast it away. It seems however, that our misdeeds are not caused by eyes, hands, or technologies, but rather by blemishes on our souls. I believe we need help to rid ourselves of those. And the help will only be effective if it comes from one with no such blemishes. We (humanity) just keep building better tools – improvement is innate. Better ways to “improve” our lives. The unhappiness is determined by our perspective. You can see this best when people’s TV goes out. They don’t know what to do with themselves. We’ve come to expect the benefits of technology whether it’s pleasure or industry. The only “dupe” is our blind reliance on it’s magic. The solution? Frequently reflect on what it is and what life was like before it. It’s a cure for the unhappiness and gives us an appreciation for limitations. You believe in gods which makes you believe in teleology. That is the reason why you are duped. I am doing everything in my power, short of self-destruction, to stop the monster. I’m struck by how you describe technology, “the technium,” in the third person – as if it has an existence separate from “us.” Technology is made by us – it is human thought made concrete. There is nothing magical about it. We (our egos) want to live forever, and technology is the tool. It helps us solve all our worldly problems (clutter, chaos, lack of knowledge), but in the end technology is just an extension of the system of thought. We don’t “willingly choose” technology, we will it into existence. it’s virtues are meaningless to the consumer – the increase it provides to our own virtues is the key. I’m more informed; more compassionate (with my responsive email and blog postings reaching tens of people); more connected to just causes (check out greenpeace.org before going to sleep). But in the end aren’t these all just extensions of who we already are? Technology is an inhuman expression of the human, of society and all its contexts and derivatives. It’s no more independent than your hand. Various incarnations of technology are truly wondrous, but in the end just things we create to be better people. Since we spent a million years as human beings terrified by predators, any visual or audio signal representing a novelty is associated with something potentially dangerous. The reptile brain mechanisms get activated. This is one of the reasons why it is difficult to stay in front of a TV and ignoreing moving images. Every time there is a new stimulus, it activates the mechanism of reward. On the neuroscientific level this means that dopamine gets released in neural circuits which leads to the sense of well-being and euphoria. The events on the Net which activate the reward system and which anticipate reward are numerous: from new email announcements to announcements of new messages in forums to chat or Twitter messages to refreshed news sites to the arrivals of new articles in RSS feeds. Our inner reward system makes us click repeatedly and produce new inputs from the Net. The mechanism is activated not only when there is a stimulus which rewards but also when there are stimuli that anticipate the reward. Therefore, a simple sound signal of an incoming email or of a message gives us a good release of dopamine even if it turns out to be a spam message. As for any action which activates reward mechanisms, another mechanism comes into play: that of an addiction. As stimuli become predictable, the reward becomes less. The stimuli which previously provoked a certain neural activity, in time donâ€™t give the same effects any more. It’s non a conspiracy of CEOs, is just how things are. Seems that novelties have an irresestible appeal. At a certain moment the novelty in our culture assumes the meaning of improvement, of advancement, of progress. Before the invention of the telegraph information could only travel at the speed permitted by the terrestrial means of that epoch, typically, at a horseâ€™s speed. With the telegraph, information and its transportation became dissociated for the first time. Neil Postman affirms that just shortly after the historic demonstration of the telegraph by Morse the fortunes of newspapers ceased to depend much on the quality or the usefulness of the articles but on the quantity, the distance and the speed of dissemination of the information, setting the basis of the current model of real-time news and the race to be the first to spread them. From an economics theory perspective, the benefits to much of technology are felt directly by the person making the choice to use that tech. However, the costs to using it are often either deferred, or are shared. The toxics used or generated in smelting metal for a knife, or in making the circuits and plastic for a computer are not found in the consumer’s immediate environment. And when they may be found there, the connection to the technological product is not as clear as the benefits are. So, the cost-benefit analysis in our backbrain sees the benefit, but sees only a small cost. So, we adopt the tech. It’s an artifact of how our brains work I think. One of the consistent things that technology does is separate production from use. One of the consistent things about having a “simpler lifestyle” is re-connecting production and use. I’m interested in thinking about choosing technology with the forebrain. We do choose in our society, but it’s usually through economic means or political pressure. Some groups – Amish for example – make explicit choices. It’s an interesting idea, but their choices and mine would be different. Also, humans have been dealing with rapid technological change for relatively few generations. We’re really not that used to it yet and still seeing the new sparkling thing in front of our eyes. Everyone? Not even nearly in my experience. That might explain your view that this is a ubiquitous phenomonen.